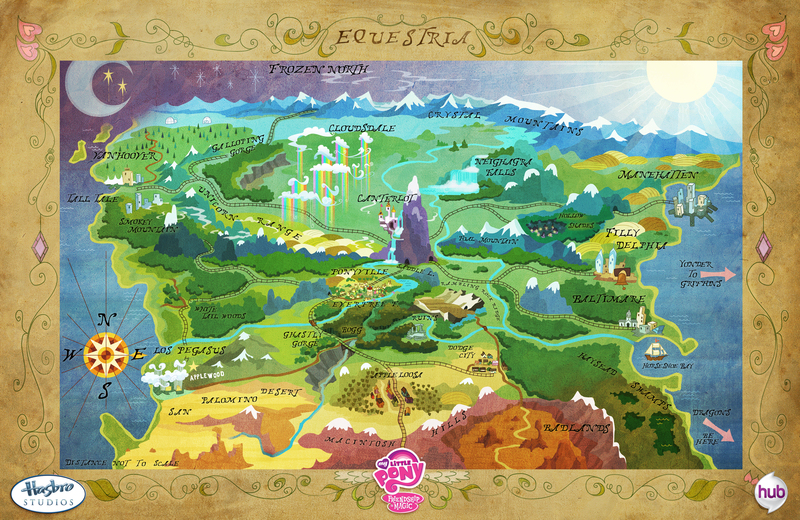 My final map of Equestria. Since I'm not sure whether, canonically, Equestria is the entire planet, a continent, or a country, I'll just label the region as the Equestria region. used in this game. The implication of the six elements of harmony along with six other elements that strengthen the power of friendship. One of the most important parts of the game of Pokémon, and in turn, the game of Ponymon, is a good foundation in typing. What's more foundational than the types themselves, however, is the relationship between the types. when it comes to strengths and weaknesses. The problem with this though, is that, unless the average stats of each type, or of each individual Ponymon for that matter, are balanced, the varying differences in the stats of each type will cause unbalances in the types. If the stats AND the types are both individually balanced, the game will become incredibly boring. This said, the best thing to do in order to create better balance overall, both the types and the average stats of the types need to be balanced. A type that has more strengths over weaknesses should have stats that are more challenging to work with and a type that has more weaknesses over strengths should have stats that are easier to work with to compensate with the weaknesses. For example, Laughter, has two strengths and two weaknesses, both offensively and defensively. Loyalty also has two strengths and two weaknesses defensively, but offensively, Loyalty has 3 offensive strengths and 4 defensive weaknesses. Due to this overall defensive lacking, Loyalty would have to have some stat advantage over Laughter. This is what makes a good, although apparently haphazardly, balance in the typing. Before I get into matching up the types, it is important to put a few lines into defining each of these elements of friendship and harmony. With that, it will be better to understand the points made when the topics of matchups are brought up. After a brief overview, I will write up a bit on each type's strengths, weaknesses, immunities, and neutralities, based on the elements themselves in friendship as well as the characters of the show that represent them (much less the latter than the former). Laughter is an element of friendship that is hard to take seriously, but that is often the point. Good friends can go out and have fun together and have great laughs, sometimes about things that would make no sense to other ponies. The Element of Laughter represents having fun, getting laughs, pulling pranks, and playing games. Loyalty is an obvious aspect of a good relationship of any kind. It's important to have friends that you can depend on and count on when you need them the most. No one likes having friends who are still open to better options. The Element of Loyalty represents sticking around and being there, even if it means sacrificing things you hold important. Like Laughter, Magic is another understood element, though even moreso than the former. Magic doesn't just involve fancy spells and funny hats. In every system, there is an immense, near inescapable chance of one tiny part going wrong and the entire thing collapsing. Friendships are expected to last through all kinds of hardships, and that last bit of Oomph! (No not the German Rock Band) is what makes it all work. The Element of Magic involves a little bit of many things, including responsibility, perserverance, devotion, and, sometimes, just dumb luck. It's hard to stay friends with somepony who isn't always a straight shooter with you, and friendships always appreciate a good amount of honesty, whether it means telling somepony you love the truth, even if it means they might be hurt shortly, but saved in the long run, or whether it means fessing up to something you did, even if it means that pony will be mad at you for a very long time. The Element of Honesty represents dependability, trustworthiness, and truthfulness at all costs. It's nice to be important, but it's more important to be nice. Everypony likes a friend who can speak and act with kindness. Sometimes Kindness can be mistaken for weakness, especially when somepony is TOO kind to people. Despite being a potential doormat to other ponies, the Element of Kindness doesn't only represent being nice to other ponies, but it represents seeing that, deep down, everypony is a good person just wanting a friend. A good way to make friends is to be generous and give somepony something that you think they need more than you. Whether it be money, clothes, your time, or even something as simple as a sandwich. Sometimes, being generous means giving away the things you love most just to make a friend happier or better off. The Element of Generosity represents charitability, patience (generous with your time), and overall big-heartedness. In order to make anything work, including friendship, it is important to have your whole heart in it. You can't treat friendship like something that is unimportant if you value your friends. You have to be passionate about the things that matter to you, and fight for your right to them. Sometimes, it seems like things can be a bit of a competition at times, but if they are, then its your duty to fight to be at the top. The Element of Passion represents whole-hearted devotion to all aspirations, no matter what the goal is. A spirit is a hard thing to understand. Unlike passion, associated with the heart, and courage, associated with the mind, the soul doesn't really have a place in your body you can associate it too. However, the spirit is important. The spirit may be associated with a mental perserverance despite what may happen to you. No matter how many times you may fall, it is important to learn from your mistakes and become a better person, knowing that the only cost of doing so may be physical and unassociated with the spirit. The Element of Spirit represents the ability to keep on trying, no matter how many times you fail. It is always important to have faith in others. However, it is more important to put faith in yourself. Even when things get scary, dangerous, or hard, somepony who is courageous knows that whatever may be on the other side is worth the risks incurred crossing those obstacles. Knowing when and how to face your fears is what the Element of Courage represents. Light is a major element in the environment that good friendships are subjected to. Whether it is something as tangible and obvious as daylight, brightness and the ability to see, or something less concrete, like the right path or uncovering the truth, its easy to see that Light is a straightforward Element that affects Friendship, most often positively. The fear of the dark is one that has been prevalent throughout pony history. The fall of night has always been a time to sleep for most ponies because it is "too dangerous" to work at night. The danger presented, of course, isn't the darkness itself, but the possible dangers taking advantage of the large hiding spot that darkness provides. The Element of Darkness represents the inability to see, nighttime, and concealment, whether the cause is good or bad. Between knowing something and not knowing something, there is knowing that you don't know something and not knowing that you do know something. Make sense? Well Chaos isn't supposed to make sense. Chaos heeds no logical boundaries, from chocolate milk clouds made of cotton candy, to a dust bowl made of black pepper just to watch everypony sneeze. The Element of Chaos represents things that just plain don't make any sense.